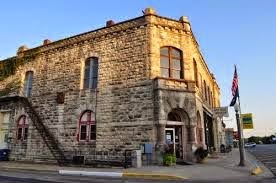 My mother was born in Alma, Kansas, a small market town located in the eastern hills of Kansas just before the break into the wide expanse of the prairie some 24 miles to the west. We used to go there when I was a kid, and as we approached the town, driving through the rich soil of the farmlands that surrounded Alma, one thought always came to mind. It was this – this was the soil that birthed my mother, and in a sense, me as well. It was from this soil and others like it that I came into being. 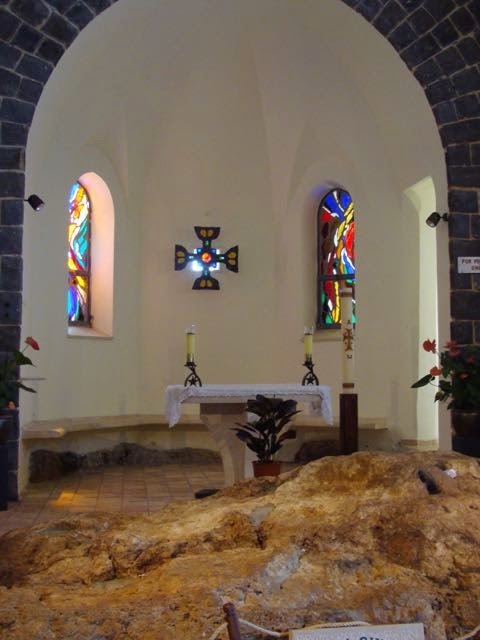 That same thought came to me as we began our pilgrimage to the northern tier at the top of the Sea of Galilee. 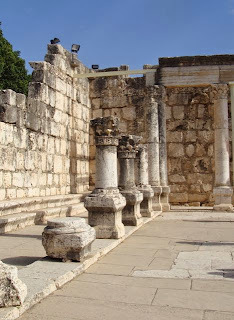 We drove north from TIberias through Magdala (I had hoped we would stop their at least honor the Apostle Mary – but we did not), and then past Tabgha to Kefer-Nahum, or Capernaum. If there was a soil from which Christianity had sprung it was most certainly the soil of this place. As we glanced around the countryside we could see that it was well watered and lush – the perfect image. Somewhere I have a photograph of me at the age of 30 standing in this same synagogue marveling at its beauty. It was the soil of thought for so much of my subsequent ministry. The synagogue is not from the time of Jesus, but much later, and it is not the main attraction but rather the house of Peter that rests under buildings and churches that were built on top of it. The current structure, Franciscan, literally hangs over the site, with a huge hole in the floor so that pilgrims can peer down into the house. If Bishop Spong is correct, it was the soil of Peter that nurtured the Easter message of hope. So we do him honor here, with readings and prayers. There is, however, more, and here I need to make a comment. Many of the sites that we have visited and will visit have a specious quality about them. They trouble me, for I think they hide the mystery. A fellow pilgrim gives me food for thought. "Think of them as you do the stations of the cross," she says. She is right - we are not honoring exactitude or even reality, but rather the significance and essence of the holy places. 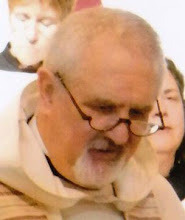 The next two sites are “The Primacy of Peter” and “Mensa Christi”. 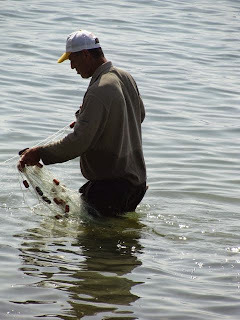 While standing on the shore of Galilee, I notice someone casting nets – how perfect. For it is in such a work-a-day place that Peter has the revelation about the true nature of Jesus, and it is on the rock at the base of the altar in the church next door, that Christ prepares a breakfast for his followers, and reveals himself to them. I need to be reminded of the ordinariness of it all. 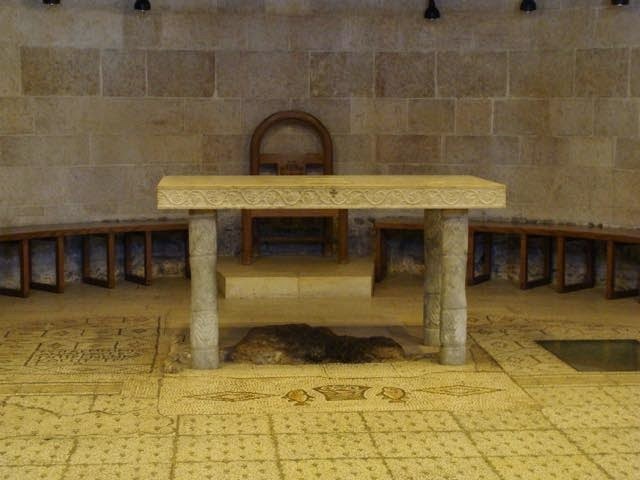 At Tabgha we visit the stunning Benedictine monastery with its wonderful mosaics. 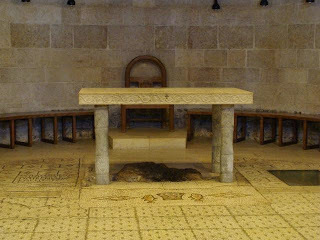 You can just glimpse the bread and fishes at the foot of the altar in the picture below. The other mosaics portray wildlife and the struggle to live, birds and centipedes, all strive bring life out of the soil of the earth. 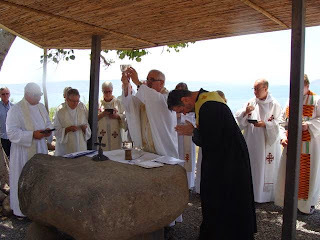 At the lakeside on the monastery grounds we celebrate a concelebrated mass, and I am privileged to lead it. 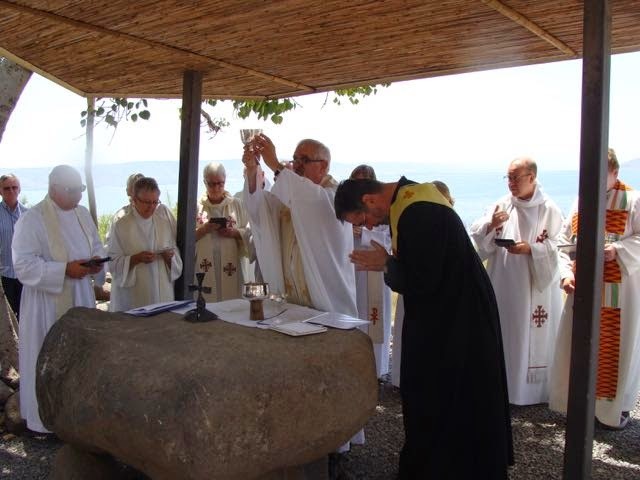 The gracious Benedictines provide proper vessels and elements for our Eucharist. Lunch is at the convent located by the Mount of the Beatitudes Church, a product of Mussolini’s megalomania – but none-the-less handsome in its own way. It reminds me of the church that he had built on the grounds of the EUR in Rome, the Church of Saints Peter and Paul. It’s a post-modern building before there even was such a thing or concept. Take a Palladian chapel and strip it of all ornamentation, preserving the mass of the building and you have a sense of these churches. I remember being here forty years ago when we had a prayer service in the church accompanied by the song of the birds. One of the readings during our pilgrimage, from Ezekiel, talks of streams of water coming out of the temple, and forming a river that flows out to the nations. 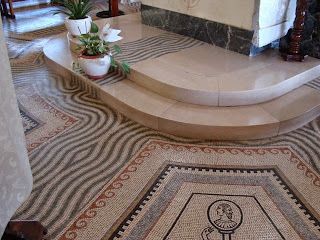 Perhaps that is what the artist had in mind when he or she did the floors of The Church of the Beatitudes. We go on to Ein Gev and grab a boat to cross the Sea of Galilee. In the midst, the skipper shuts down the engines, and we drift in silence – a silence that invites us to sleep in the stern of the boat as Jesus did. Earlier, Arthur commented on the absence of motor noise. Now the silence is deafening and welcome.